Nearly all Americans consider themselves patriotic and voice pride in being American. Sizeable demographic and political differences do emerge, however, when it comes to intense expressions of patriotism. And many of those who voice strong patriotism and pride in the country also are highly critical of the federal government and its political leaders. 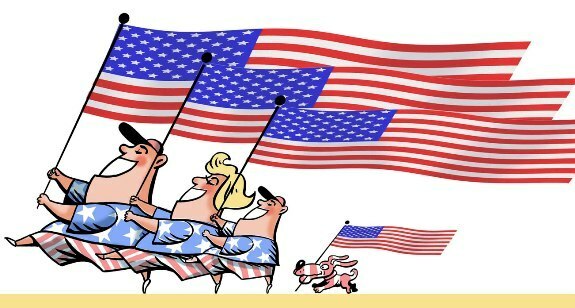 A new national survey by the Pew Research Center for the People & the Press, conducted June 24-27 among 1,001 adults, finds that more than eight-in-ten (83%) say they are either extremely proud (52%) or very proud (31%) to be an American. Just 14% say they are moderately proud (8%) or have little or no pride (6%) in being an American. Nearly six-in-ten (59%) non-Hispanic whites say they are extremely proud of being an American compared with 36% of non-Hispanic blacks. People younger than 30 also are less likely than older Americans to say they are extremely proud of being an American. Those who give Barack Obama the lowest job ratings — predominately Republicans and independents who lean Republican — also are more likely to say that they are extremely proud to be an American than are those who give the president more positive ratings. A survey conducted earlier this year asked respondents to compare their own level of patriotism with that of their fellow citizens. Most people (59%) say they are about as patriotic as others. Just a third (33%) claim to be more patriotic than most other Americans. Notably, those who take a particularly dim view of the federal government — including those who agree with the Tea Party movement — are among the most likely to consider themselves more patriotic than most people in this country. More men (36%) than women (30%) say they are more patriotic than others and racial and age differences in these attitudes are also noted. More than a third of whites (35%) say they are more patriotic than others, compared with 26% of African Americans. And people ages 65 and older were more likely (at 42%) than younger age groups to see themselves as more patriotic than others. The picture is largely the same when it comes to a key way that Americans express their patriotism: displaying the American flag. Asked in a June 8-28 Pew Research survey, nearly six-in-ten (59%) say they show the flag at their home, office, or on their automobile. Men and women are equally likely to do this, but there are large differences by party affiliation, race and age. Majorities of people ages 30 and older display the flag, compared with 42% among those ages 18-29. Republicans are more likely than Democrats or independents to display the flag (72% for Republicans, 51% for Democrats and 59% for independents). And far more whites (65%) than African Americans (37%) say they display the flag. Showing the flag was especially popular in the aftermath of the Sept. 11, 2001 terrorist attacks. In August 2002, 75% said they displayed the flag.